These airmen supervise aircraft electrical and environmental functions and activities aboard Air Force aircraft. Their work includes troubleshooting and rewiring systems that affect everything from systems to cabin pressure to engine control. Their work is specifically focused on the electrical systems that support the environment for personnel and passengers inside the aircraft. The Air Force categorizes this job as Air Force Specialty Code (AFSC) 2A6X6. These airmen inspect, troubleshoot and maintain electrical and environmental systems aboard Air Force aircraft, including all subsystems, components and test equipment. They'll work with systems that include direct and alternating currents, gas turbine compressors and auxiliary power units, such as steering, landing and nose wheel controls, as well as ignition, starting, lighting, takeoff and landing controls. They're tasked with troubleshooting and repairing systems that control door depressurization, fire extinguishing and suppression, fuel control, liquid cooling, air conditioning and cabin pressure for the cockpit and main passenger areas. To be eligible for this job, you’ll need a high school diploma or its equivalent, and have knowledge of electrical principles. You have to have normal color vision and depth perception and need to have a state driver’s license in case you need to drive government vehicles. 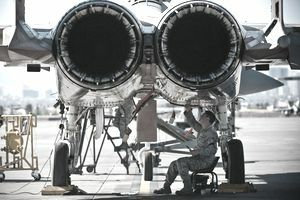 There are a few ways to prepare for this job before you enlist in the Air Force; knowledge of electrical, electronic and mechanical principles of aircraft and their environmental systems is important, as is an understanding of their concepts and applications. An ability to read blueprints, wiring diagrams and schematics also is a plus, and some basic understanding of the proper disposal of hazardous waste would be helpful. If you don't have all of these skills, don't worry; you'll receive detailed instruction during your technical training (more about that later). All Air Force recruits (like other branches of the U.S. military) take the Armed Services Vocational Aptitude Battery (ASVAB) tests to determine their ideal career field. To become an electrical and environmental specialist, you'll need a composite core of 61 in the electrical (E) area and a composite score of 41 in the mechanical (M) qualification area of the ASVAB. There is no Department of Defense security clearance required for this job. Following basic training and Airman's Week, airmen in this job spend 91 days in technical training at Sheppard Air Force Base in Texas. You'll learn the ins and outs of basic aircraft electrical and environmental procedures and systems, including the latest troubleshooting and repair protocols. Once your tour in the Air Force is completed, the skills you learn in this role should help you qualify for jobs in the public and private sector repairing electrical systems, including HVAC in industrial, commercial and residential structures. Some additional training and licensing will probably be required, however.